This drawing was created by artist Gunnar Jenssen using design markers and pen. It is entitled Rhaeghor The Terrible. 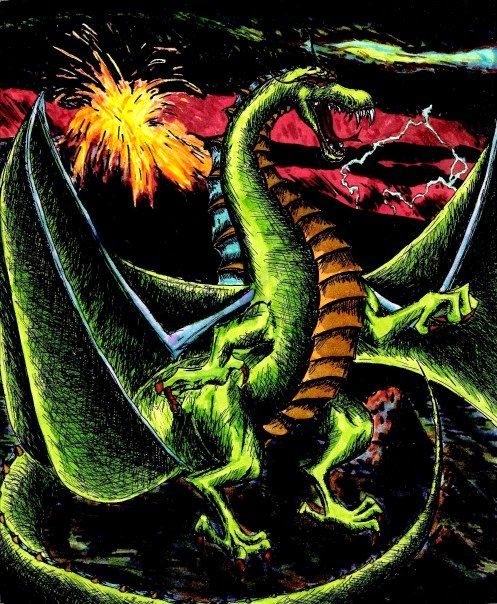 Gunnar has always had a fascination with these mythical creatures and has loved drawing them since he was a young boy. He has used multiple forms of techniques in this drawing such as cross hatching, shading, blending of color, and more. If you don't like working with design markers, you could use Prismacolor colored pencils, charcoal, pastels, etc. Each medium will produce different results, and different variations in color tone and vibrancy. Also working with each medium is slightly different. Create your own dragon like Rhaeghor The Terrible, or whatever else fascinates you!